IT WAS CHRISTMAS EVE BACK IN 2001 FIXING TO BE MY FIRST CHRISTMAS WITH MY HUBBY AND WE WERE SO HAPPY. I HAD TO DROP A LOADED TRAILER IN THE MIDDLE OF NOWHERE AND PICK UP AN EMPTY AND HEAD TO THE YARD. I WAS 3 HOURS AWAY FROM BEING ON CHRISTMAS BREAK I COULDN'T WAIT. ALL SEEMED TO BE RIGHT ON TRACK DROPPED MY TRAILER AND FOUND THE LAST EMPTY ONE ON THE LOT. I GOT READY TO PULL IT OUT OF THE HOLE AND AS I WAS TURNING I HEARD A LOUD POP AND ALL THE BREAKS LOCKED UP. I GOT OUT AND LOOKED TO SEE WHAT THE PROBLEM WAS AND NOTICED THAT MY GLAD HAND HAD COME LOOSE I WASN'T WORRIED I HOOKED IT UP AGAIN AND HOPPED BACK IN THE CAB AND WENT TO TAKE OFF. WHEN I DID THE GLAD HAND CAME OFF AGAIN. WELL I GOT OUT AND LOOKED AND REALIZED THAT THE GLAD HAND WAS BENT OUT AND WOULDN'T HOOK UP RIGHT. I WENT INTO THE GARD SHACK AND CALLED THE COMPANY. THEY TOLD ME THAT THEY WERE SHUTTING DOWN AT MIDNIGHT FOR X-MAS AND WOULDN'T BE OPEN UNTIL THE DAY AFTER X-MAS AND THERE WERE NO MORE TRUCKS COMING IN THAT NIGHT SO I WAS ON MY OWN. HAPPINESS TURNED TO FRUSTRATION. I HAD NO DUCT TAPE OR BUNGEE CORDS TO HOLD IT TOGETHER. JUST AS I WAS GIVING UP HOPE I SAW THE LIGHT OF A TRUCK PULLING IN! I HOPED THEY HAD SOME DUCT TAPE. AS I LOOKED I REALIZED THAT THEY WORKED FOR THE SAME COMPANY I WORKED FOR. AFTER I JUST HAD BEEN TOLD THAT I WAS ON MY OWN! I WENT OUT AND TALKED TO THE DRIVER HE HAD DUCT TAPE AND BUNGEE CORDS AND TOLD ME HE WOULD HELP ME OUT! HIS NAME WAS MICHAEL. HE DUCT TAPED AND BUNGEED UP MY GLAD HAND AND TOLD US TO GET IN FRONT OF HIM SO IF IT CAME LOSE HE COULD FIX IT AGAIN. WE MADE IT TO THE YARD AND HE WENT ON HOME. I WROTE DOWN HIS TRUCK NUMBER SO I COULD LET THE COMPANY KNOW HOW GREAT HE WAS. I WORKED FOR A SMALL COMPANY SO I KNEW HE WOULD GET HIS DUE. WELL I CALLED MY DISPATCHER THE DAY AFTER X-MAS AND LET HIM KNOW. HE TOLD ME THAT THE COMPANY DIDN'T HAVE A TRUCK WITH THAT NUMBER I GAVE HIS NAME AND HE WASN'T IN SYSTEM. THEY CALLED THE YARD WHERE I WAS AT AND THE YARD TOLD THEM THAT THE ONLY TRAILER THEY HAD WAS THE ONE I DROPPED THAT NIGHT. 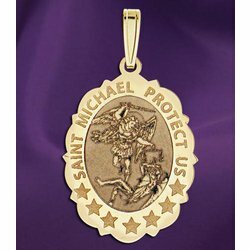 WHEN I WENT OUT TO MY TRUCK TO PULL THE DUCT TAPE AND BUNGEE CORD OFF I FOUND A SAINT MICHAEL CHARM TAPED INSIDE THE WHOLE THING! TO THIS DAY I SWEAR SAINT MICHALE WAS THERE AND HELPED ME OUT IN MY TIME OF NEED. YALL CAN FORM YOUR OWN OPINION. God works in mysterious ways. Just give Him thanks!